Found at a La Canada estate sale. Old school front striking style. Anyone ever heard of Francisco's? Was it good? HAS ANYONE HEARD of it???? Of course. And some have WORKED there!!! The one on Fig & 26th is now an IHOP. I worked at Fransicso's for two months the summer of '76 before starting college. I was a hostess and on the weekends, a toast girl for the breakfast rush. I had blistered/burned fingertips. It was a coffee shop but a cut above others (or at least I thought so). Had the best tuna melts and cheesecake back then. BTW - I'm stealing these photos but only as a personal momento. Thanks for finding and posting this! I'm sending Pasadena Adjacent this way next. She remembers Francisco's too. Yes, and while Tash was burning her finger tips I was working around the corner on Lacy street across from the animal shelter (wasn't there at the time) in the building that now houses a strip joint. Back in the late 70's it was the home of "All Good Things" . A company that put out three separate styles of Bongs (The Putt Putt, Big Mama and the Trucker) and a joint roller called the Aladin. Then a law came into effect disallowing the sale of tobacco related items to record shops (remember the Warehouse?) and put us out of the bong business. We limped on for awhile making parts for Darth Vader Masks then folded. The building next became the film set for Cagney and Lace. Looks like the one on Arroyo Parkway is an IHOP too. I've always thought of that when I drive past. 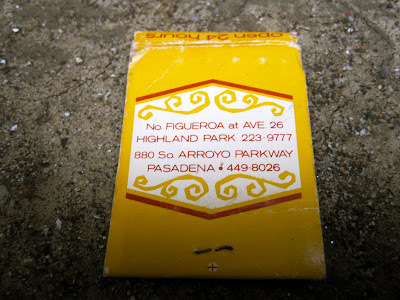 Yes, Francisco's was better. It's good that IHOP is still there if anyone wants the basic food offerings they have but it's not a destination as Francisco's was. And the sister? Got her degree, is a teacher somewhere in Michigan. 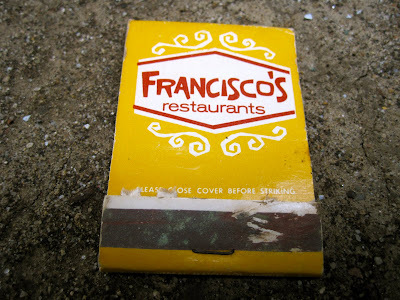 i'm late to the game here but i have to say i've got a huge soft spot in my heart for old franciscos. i was so young when my parents took me there, sometimes i feel like it was never real. i had my very first taste of french toast there and nothing has ever compared. if i close my eyes, i can still see the old guy at the register who always was so nice to us. gracias for posting this and bringing me back to those tasty, syrupy, perfect brunches. Thanks for all the knowledge dropped in here!!! Guess I need to find more matchbooks.